Let’s all help fellow Brit Christian find a job! When did you arrive in Toronto and what brought you here? I’ve been here for a couple of months after leaving England with my (Canadian) girlfriend. She had been teaching back in England but got a job recruiting teachers from Canada once her visa expired. After a two-week holiday over Christmas to meet the parents, etc. we decided I would come this summer and try the Canadian life! What stage are you at: landed immigrant, permanent resident, citizen? So far, I’ve just been playing the tourist role. I’m here only on the six months allowed as a visitor but now plan to stay longer and find work. As far as I can tell, the best option from here is to apply for the International Experience Canada and if all goes well, the common-law sponsorship after that. At this point though, any advice is welcome! I’m trained in the sport and leisure industry and have a high level of football coaching badges (currently doing some voluntary coaching in Ontario). Where that hasn’t been a full-time position for me in the past, I’ve worked in education for the past four years, working in behaviour management and pastoral care. For now though, I’m happy to try my hand at anything! What has been the best and worst aspects of the experience of coming to Toronto? So I’m currently in the GTA (Oakville) but it’s so easy to get into Toronto, the people are mostly friendly and there’s plenty to do, with quite a lot of free options too. Enough sport to follow for someone keen on that topic and as an avid Tottenham fan, seeing JD again is good for me. Downside? HST drives me mad! Open question: what would you like to ask our readers, tell them or talk about? 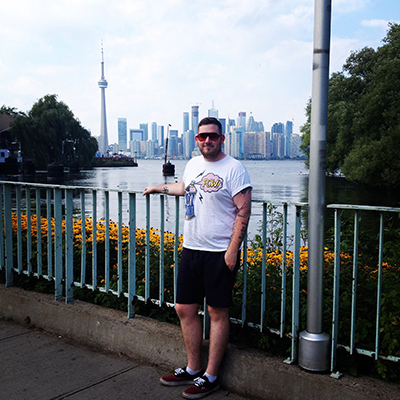 Use this as a chance to give your account of a British newcomer to Toronto. I’ve met a couple of Brits so far, but sites like this can be so helpful. Any advice you can give/receive can go a long way. Saying that, after reading this, any advice you want to give/ask you can e-mail/Tweet me … I’ll leave the details at the bottom. My one piece of advice to sign off with would be to take any opportunity that someone may give you, be sociable, explore and interact with people. You only get one life, enjoy it! This entry was posted in Uncategorized and tagged brits in toronto, christian, international experience canada, jobs on October 19, 2014 by britsintoronto.